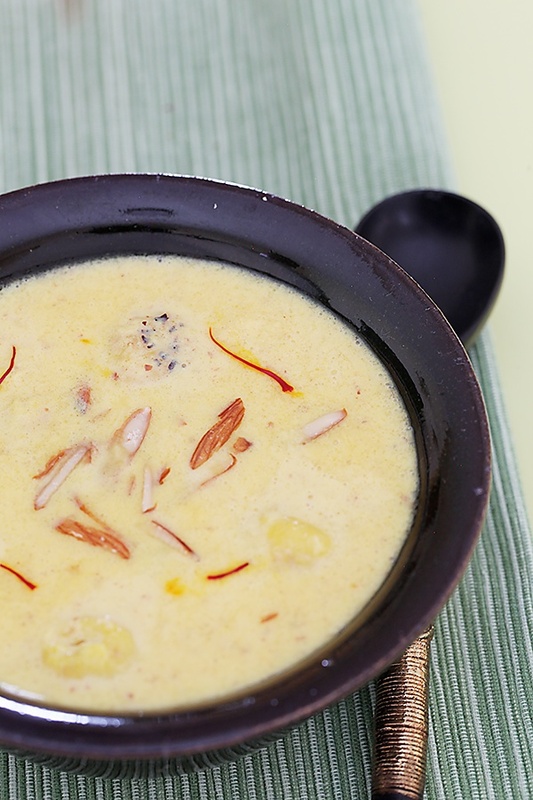 Whenever I cook a festive Indian meal, Kheer happens to be an integral part of that menu. It could be the usual rice kheer, sevaiyan kheer, komola kheer or kheer made with fruits or it could be a unique combination of ingredients if inspiration strikes at the right time. Kheer, derived from the Sanskrit word ksheer for milk and kshirika for any dish cooked with milk (ref. K.T. Achaya, A Historical Dictionary Of Indian Food) is known to be the food of the gods. 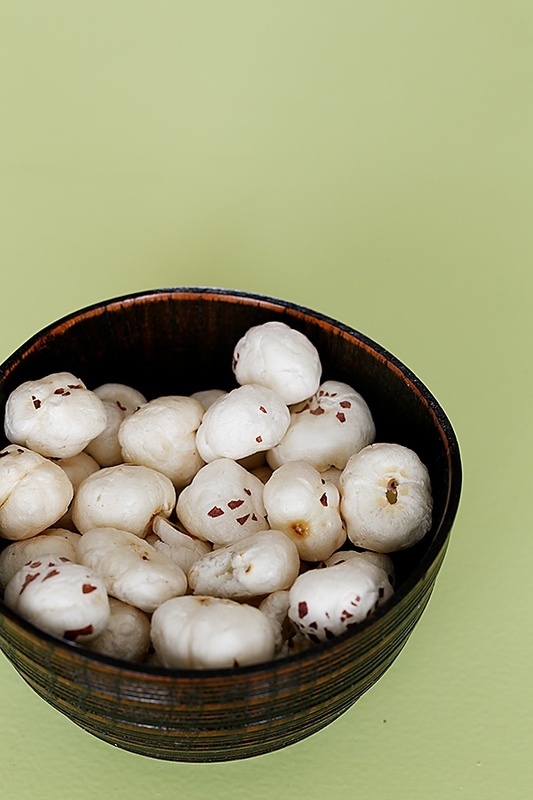 I grew up listening to many stories about kheer, some of them being humorous accounts of the great lengths people went through, to procure a pot of kheer. While reading stories to my little one at bed time, I found that many Indian folk tales have kheer as one of the central points, around which a story revolves. And I must confess that this makes it all the more interesting for me to cook kheer. I find that making kheer is quite magical as well. 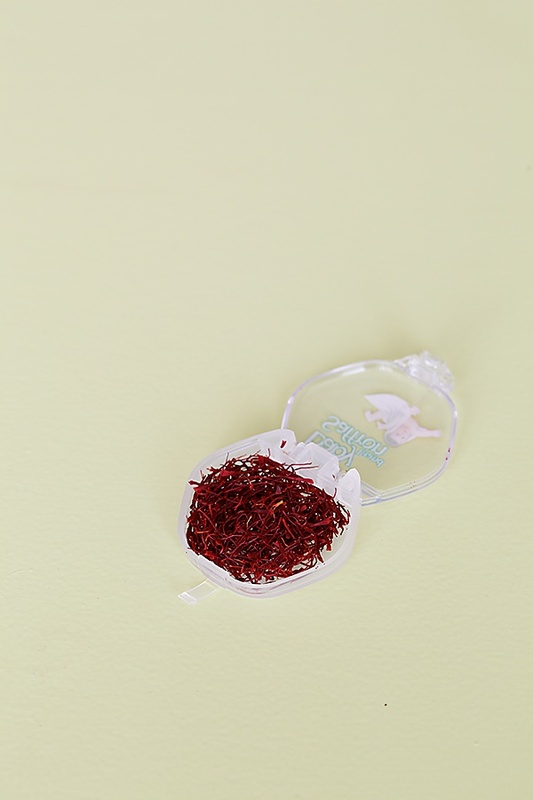 Working my way through all the beautiful ingredients and spices like the saffron and cardamom, cooking and offering my respects to the supreme for bestowing such wonderful ingredients to work with and lastly, savouring and sharing the ambrosial kheer is soothing and satisfying to me. The warmth that a bowl of kheer brings is very comforting and I like to eat my kheer warm or hot unless ofcourse the kheer is made with fruits that need to be served cold or at room temperature. Some people like to have their kheer cold, so I find myself dividing my kheer into two batches to be served warm and cold, according to one’s taste and preference. Makhana (foxnuts) and badam (almonds) are the heroes of this dish. Both ingredients are nutrient dense and filled with a variety of tastes and textures. The makhana when roasted and cooked in milk develops a hearty texture which is very pleasing to the palate. And the almonds give a good consistency to the kheer by thickening it and imparting the kheer with their most wonderful flavour. This combination of these two amazing ingredients is sure to win the hearts of those who taste it! In a wok or kadhai, heat the ghee and when it melts, roast the makhana for 4 to 5 minutes, until it is nicely and lightly browned on all sides. Make sure that the makhana does not turn black. 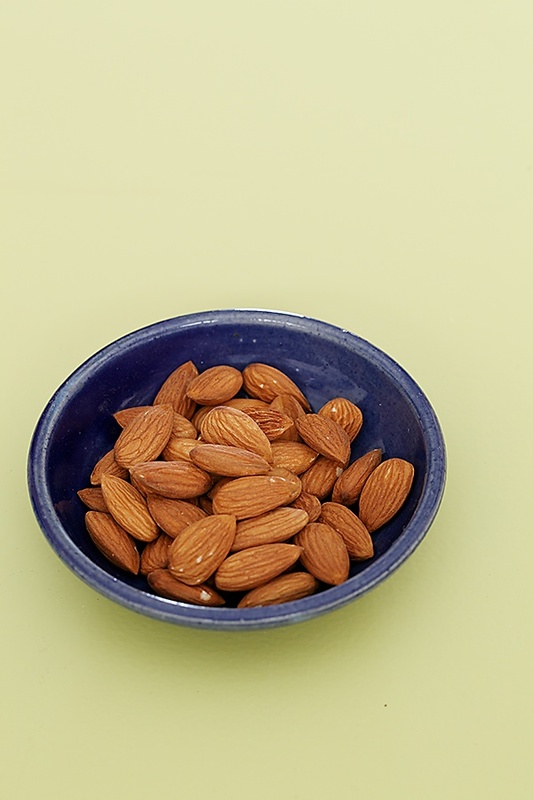 Pour the milk and the powdered almonds, along with the saffron and allow it to come to a boil. Lower the heat and cook until the milk thickens. Turn off the heat and add the cardamom powder and sugar. Wow! What a simple and easy recipe. Must give it a try. As usual, lovely usage of props and fabulous photography. Very unique recipe! Never thought of making kheer with Phool makhana. I will try this one soon. Rashmi: Thanks! Hope you like this when you give it a try! 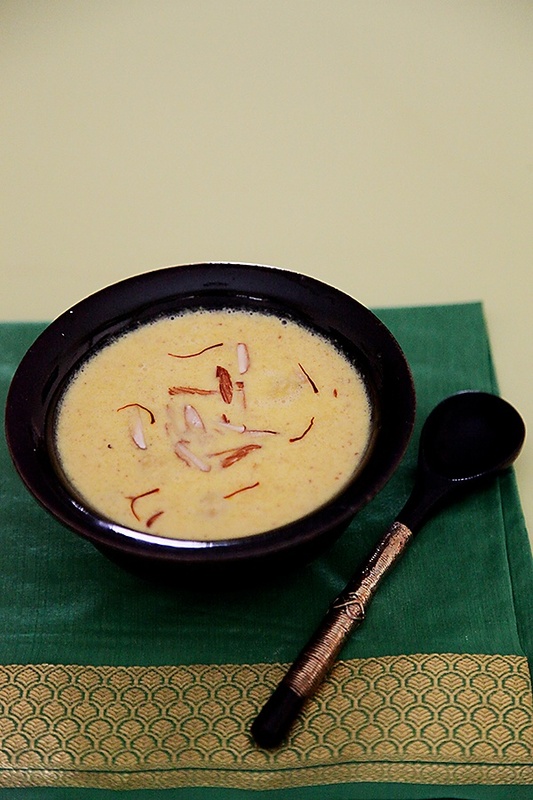 Raji: Even I was a bit skeptical about makhana kheer as I love snacking on the savoury version. But, this really blew my mind! 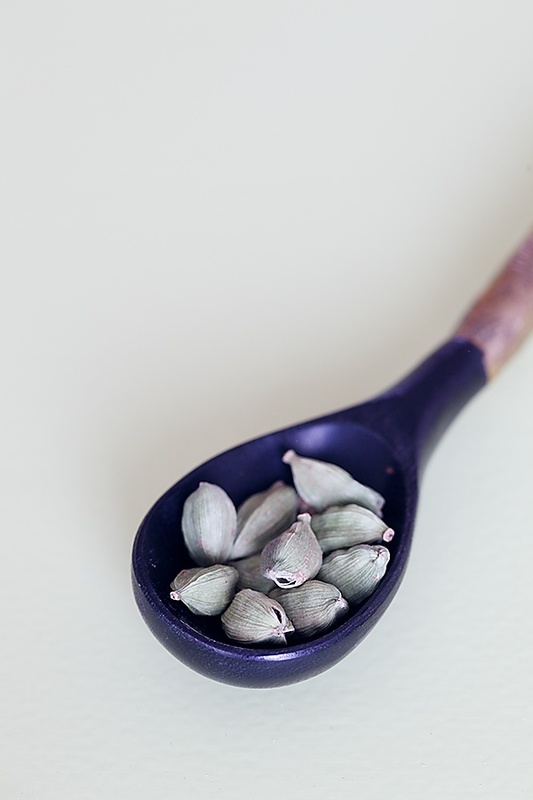 I am a fairly new visitor to your virtual kitchen, watched couple of videos and many of blog posts. Also, promptly dropped a line(email) to you as well. I tried the Kheer recipe 1/2 hr back for dinner and it turned out so yummy. Love that it is quick to make and fairly a healthy sweet recipe compared to other deep fried dunked in sugar syrup recipes. Sheela- A warm welcome to you! Hope you enjoy all the recipes here. Look forward to hearing more from you.